Lisa Collins, EC2055 director of economic development (7th from left), Marc Masoner, AIM founder and CEO (8th from left), Georgia Gov. 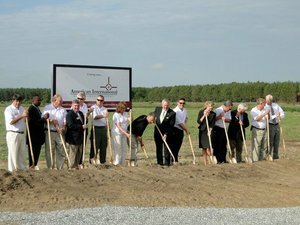 Nathan Deal (9th from left), and Barton Rice, Ec2055 Executive Director (10th from left), participate in the groundbreaking ceremonies. Blakely, GA – Governor Nathan Deal and more than 100 dignitaries, government officials, community members and guests took part in the recent groundbreaking ceremony for the American International Marksmanship Academy (AIM) in Blakely, Georgia – a new venture that will serve as an important foundation for Early County 2055’s ongoing Economic Development Initiative. AIM, a comprehensive, practical private shooting facility, will provide training and education to military, law enforcement agencies and civilians as well as offer professional and corporate membership packages, event opportunities and world-wide shooting competitions. “I am proud to be a part of this significant celebration in Early County,” said Governor Nathan Deal. “We are excited about this new venture and know that the American International Marksmanship Academy will be a real boost to the local economy, as well as the region and the state of Georgia. I want to commend the community for their hard work and dedication. This is a powerful example of how a community has joined together to help bring prosperity to the area. My sincere thanks to everyone that helped make this happen." The company chose Early County as its headquarters because of the proximity to military bases such as Fort Benning, GA and Fort Rucker, AL, which will benefit from the new training facility. AIM’s long-term strategy is to provide military and government specialized operations training, National Guard and Reserve Unit training for specific overseas deployment and security training for civilian operations. AIM expects to offer approximately 100 immediate employment opportunities to area residents, 200 jobs after two years, and up to 400 jobs when the facility is fully operational. Instructors will be drawn from a top-notch pool of law enforcement and military experts, according to Masoner. “We have hired a group of instructors who have on-the-ground experience – ranger regiment soldiers, Special Forces and navy seals and others who have performed in a variety of combat theaters,” he said. AIM Academy is located off of Highway 27 northeast of Blakely, Georgia on 2,300 acres of land. The training facilities will have three separate training areas, including the only 1,000 meter range in the area which will be used for advanced military training. Curriculum will include sophisticated lifesaving skills, evasive and defensive techniques, dignitary protection, organization training, HALO instruction and a 5,400 foot, state-of-the-art air strip will used for various training including Unmanned Aerial Vehicles (UAVs). Collins says having the AIM Academy in Early County will have an enormous impact on the area. "The new military training center in Early County will be an asset for the Fort Benning military base, which is the home of the Army’s Infantry School and is the sixth largest Army post in the country. With the expansion of Fort Benning, as the result of military base shifts and closures, and the development of its Maneuver Center of Excellence, just the Columbus area alone expects about 28,000 service members and civilians to relocate to the region,” Collins said. “We are hoping to be a south anchor community for Fort Benning, as they move and expand their borders. Hopefully, they will choose to move south, along the U. S. Highway 27 corridor, as land is plentiful and will fit into their overall plans for future development."